This article is about the Game & Watch game. For the move used by Mr. Game & Watch in the Super Smash Bros. series, see Mr. Game & Watch § Chef. For a list of chefs in the Mario franchise, see Category:Chefs. 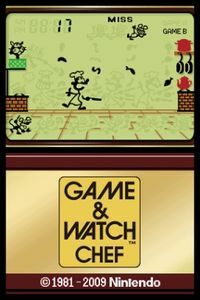 Chef is a Game & Watch game released as a part of the Wide Screen series on September 8, 1981. Its goal is to keep the food off the ground. If any food hits the ground, the player loses a life. When the player loses three lives, they receive a Game Over. It is one of the games in the Gallery Corner in Game & Watch Gallery. It is also a minigame in Game & Watch Gallery 2 and Game & Watch Gallery 4. A chef paces back and forth in a kitchen, using his frying pan to keep pieces of food airborne. The player earns a point every time a piece of food hits the pan. If a piece of food ends up on the floor, a mouse will grab it and eat it. The cat at the left-hand side of the screen will occasionally grab the leftmost piece of food with a fork, only to keep it from falling to the ground. It is also the origin of Mr. Game & Watch's standard move in the Super Smash Bros. series. As the game progresses, the food will move faster. At 200 and 500 points, any misses the player has will be erased. In Game A, the player must flip three pieces of food. In Game B, the player must flip four pieces of food. 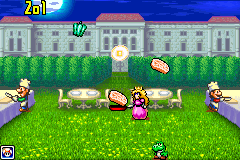 Princess Peach, who is holding a pan, has to feed Yoshi by cooking the food Mario and Luigi throw into the air. If the food gets crispy, Peach may have to feed it to Yoshi; feeding Yoshi gains a few extra points, but if Yoshi eats any burnt food, he changes into a Baby Yoshi (referred to in the manual as a "Little Yoshi"). After Yoshi eats five pieces of cooked food in a row, he lays an egg, giving the player five points; after five more pieces of cooked food in a row are served to Yoshi, his egg will hatch into a Little Yoshi, rewarding the player with 20 points. The Little Yoshi grows back up with five more cooked feedings in a row, giving the player five points. If any piece of food goes on the floor, Peach will throw a fit. On Easy Mode, only Luigi throws the food, and it goes straight up when it hits Peach's pan. On Hard Mode, both Mario Bros. throw the food, and it frequently flies off in angles when it hits her pan. At 200, 500, and 700 points, one of the Mario Bros. will toss a Heart for Peach or Yoshi to catch to remove a miss. Music is also featured, with the tempo changing depending on the speed of the game. The different foods that the Mario Bros. toss into the air each require a different number of flips before getting crispy (ex. eggs require about three flips to cook). Thanks to the GBA's graphical capabilities, the sprites of Peach, Yoshi, and the Mario Bros. are now more consistent with the characters' official color schemes. Also, the Yoshi Egg, which was pink in the original game, has its color changed to green. The kitchen is given a makeover: The windows are given gold curtains; the brickwork on the wall changes color from blue to gold; the countertop is missing the plates from the original; the base of the counter becomes gold and no longer looks like a cupboard, as it did originally; the floor, formerly brown, has its tiles recolored yellow and green; and the countertop, walls, and floor all have light from the wall sconces reflecting off of them. The previous Modern version used eggs, fish, steak, and sausages as the flippable food. Game & Watch Gallery 4's Modern Chef uses bell peppers and lobsters as well, but sausages are no longer used there. The background now changes with every 200 points the player racks up in-game. Peach will start off in the original kitchen, but after 200 points, the background will blur and then be changed into what looks like the princess's castle garden. After 200 more points are earned, the background changes back, and the pattern continues. The background music cue has its percussion enhanced for the GBA, as is the case in all other Game & Watch Gallery series Modern games ported to Game & Watch Gallery 4. 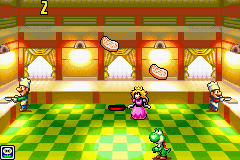 Peach's exact reaction to when food falls to the floor and getting a miss has been altered: She now screams repeatedly before wincing, whereas originally, Peach proceeded to repeatedly stamp her foot on the ground in a fit of anger. Similar to the other Game & Watch games included in the game, selecting Chef and waiting to actually start the game will have a humorous sequence play. In particular, Peach is standing next to Mario, who is sitting at a table and obviously waiting to be fed. She then flips various eggs to Mario, who eats them one by one, but then several more eggs fall down, and Peach ends up flipping them all over the table, with the quantity being such that Mario ends up buried underneath and overwhelmed before Yoshi comes in and eats them all. Afterwards, Yoshi takes Mario away. Chef info page on In the Attic, a website dedicated to classic video games. This page was last edited on April 3, 2019, at 20:32.